5 pcs. 1,61 EUR ea. from 15 pcs. 1,42 EUR ea. from 40 pcs. 1,29 EUR ea. 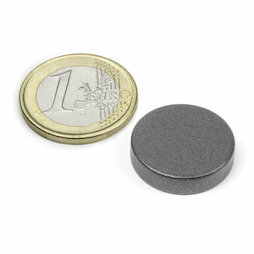 Its Teflon coating gives this disc magnet a dark-grey look. The Teflon makes the magnet nearly waterproof and very abrasion resistant. 1 pc. 2,66 EUR ea. 1 pc. 4,00 EUR ea. 5 pcs. 1,38 EUR ea. 10 pcs. 1,44 EUR ea.